June | 2014 | LIT.GAZ. I got his Travels in Siberia for Christmas the other year and thoroughly enjoyed it, so when I came across Great Plains in a second-hand bookshop in Kent on a recent holiday, I snapped it up. He travelled about 25000 miles over several years through the Great Plains area of the western USA, and the book is a composite of his travels and impressions: to someone who has never been there, he conveys a wonderful sense of the place and the people. Having said that, I think I’d have preferred a more structured travelogue, and with better maps. The account of his travels and discoveries is very well annotated; he knows lots about Native American tribes, their history and famous characters, which I found fascinating, as I also did his knowledge of the nuclear missile silos which dot the landscape. It comes across as a vast and relatively empty area, sometimes spectacularly beautiful, at other times almost totally featureless, an idea which it’s very difficult for a European to get his mind around. I found that his style and tone at times echoed both Garrison Keillor and Bill Bryson: perhaps this was because they are all three Americans, and write about similar places in their homeland. 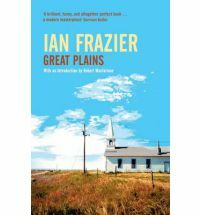 This book confirmed my enjoyment of Frazier as a contemporary travel writer; I shall be on the lookout for more. 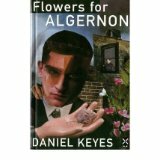 Another reactive post: today the death of SF writer Daniel Keyes was announced; I’ve long admired this novel, and as a former student of SF, wanted to add my thoughts and appreciation. We follow his story, the changes he undergoes and difficulties he faces, and his interaction with the scientists whose experiment he ultimately is. Keyes’ master-stroke was to have Charley tell his own story from start to finish as a diary, complete with his poor grammar, spelling and understanding of the world, his naivete, his feelings and emotions in his own words, at the outset; his growing intellect is reflected in his style and attitude, as is his end… it would be very hard not to be moved by the picture Keyes paints, because to have known and to know one will lose, and to see the loss, is surely tragic. Back in my days as a teacher, it was a great text to use at GCSE. I paired it with Mary Shelley‘s Frankenstein, another novel about a scientist experimenting with life from a completely different era. We looked at how the writers explored the changes undergone by the subjects of the experiments, and how they also explored the responsibilities of scientists towards society and their guinea-pigs. Students produced some very thoughtful and high quality work; we were able to consider how the novels were written differently because of the time, how writers structured stories, and how they manipulated readers’ responses. In Gove-land, this will not be permitted. There was apparently a film made of the book, which I have not seen. And Algernon, if you are wondering, is a mouse which underwent the experiment before Charley and became his pet; Algernon’s death makes everyone realise that the experiment has not been a success…. Today is Bloomsday, and although it’s quite some time since I last re-read Joyce’s Ulysses, there’s always a small leap in my spirits whenever I recall it. I think I’ve read it three times so far, although it’s a novel which, in the end, I respect greatly rather than love for ever. I’ve never fully warmed to it as I have to other classics. I had to read it, having studied A Portrait of the Artist as a Young Man for A level many years ago. I have still no liking for the character Stephen, but I do like, even warm to, Leopold Bloom, who seems human and humane in a way that Stephen doesn’t. It is an astonishing achievement as a novel; the idea of focusing all the action in the single day (16 June 1904) and place (Dublin), and the wealth of writing styles as the eighteen sections unfold… I have always particularly liked the parody section, and the question and answer section. Novelists have always experimented, and Joyce was one in a long line; experimental writing isn’t always easy to access, but it shows others possibilities they may not have contemplated, and ultimately enriches the whole world of literature. I have always loved Sterne’s Tristram Shandy, which is another challenging read, but so many of the ideas that other writers were to try out in the following centuries are foreshadowed there. It took me a long time to settle into this re-read (fifth); I thought perhaps I had gone off Conrad, and his greatest novel, but it was not so. As I reached the end, the powerful sense of tragedy gripped me again: truly, the desire for money is the root of all evil, and the undoing of many. This time round, I was very aware of Conrad’s cynicism, perhaps symbolised in the character of the journalist Decoud, whose shallowness is the ultimate cause of his suicide. At university I hated Conrad’s anti-revolutionary stance, his distrust of any attempt at change; now I perceive him not as conservative or reactionary, merely totally without faith in any good or improvement ever coming from anyone’s attempts, which are futile. It’s a dark view, perhaps understandable in view of Conrad’s personal background… I just thought about Tony Blair and New Labour, with much sadness. So, in this imaginary South American land beset by dictators and revolutionaries (it does remind me of Marquez’ One Hundred Years of Solitude) the evil dictator Guzman Bento ruthlessly tortured and killed his opponents, but brought a long period of peace to Costaguana (Saddam Hussein, anyone?). Ribiera, his replacement, is more human but ineffectual and easily challenged by the Montero brothers, who are powerful, but brutes. For Conrad, idealists talk and have fine ideas, but ultimately achieve little; real things are achieved by others circumventing these idealists. Perhaps the Englishman Gould and his silver mine show this most clearly: economic power interacts with secular power, merely to serve its own ends: it is amoral; the mine that was a force for some good initially has become another instrument of oppression by the end of the novel. Everyone is either venal or ineffective in Conrad’s world; no-one comes out of it well. On this re-reading the parallels with our twenty-first century world were quite stark, Conrad very prescient. Or I’ve got older. 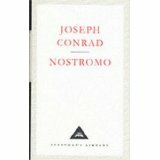 The eponymous Nostromo, who lives for his reputation, is ultimately corrupted by the silver, too: everyone has his price, and I was struck by the way his eyes were suddenly opened to the way he was used, manipulated by the rich and powerful. Conrad is a masterful storyteller: the tale is complex, the characters develop slowly, and he plays with the time sequence of events in his story to draw the reader in; the conceit of the silver mine is skilfully woven throughout the novel, its tentacles touching and sullying every character. I am glad I came back to this fine book. Ephemera: I just love the sound of that word…almost onomatopoeic! I’ve been thinking about how my reading habits have changed since the arrival of the internet, and wondering about the implications of the changes. For starters, I no longer buy, and read from cover to cover (apart from the sports pages) a daily newspaper. Partly this is because my newspaper of choice (The Guardian, since you ask) has changed markedly over the same time period, along with all the others: less serious news, and more froth, showbiz, personalities, lifestyle and consumption. Instead I ‘look through’ several newspapers online, and read the few articles that attract my interest. But: do I read them as carefully? do I take in as much of what I read? do I attribute the same weight and importance to those articles? I suspect not, because they are surrounded by dross. Yet I love the wealth of writing I can access online… as a serious reader I can read some of the brilliant stuff on the London Review of Books site, and the New York Review of Books, and Magazine Litteraire. I get the selection of interesting stuff selected by the editors of Arts & Letters Daily. I can look at political reviews, computing magazines…anything I like. So I read a lot online – or am I just grazing? time-wasting? being sucked in to a world of trivia (except, as you can see above, I’m kidding myself that it’s real quality high-brow trivia, not everyone else’s Mail Online rubbish) and neglecting the real world of books? And if I wanted to do something about avoiding all this eye-candy, could I? Somehow, when I can tell myself that this is happening to other people, I feel safer (perhaps more smug?!) than when I realise that something similar is happening to me. It strikes me there are a number of issues. Firstly, logistical and practical: as an ex-Head of English I know there are stock cupboards up and down the land which will contain hundreds of copies of To Kill A Mockingbird and Of Mice and Men. These will now be redundant; major new and expensive purchases will be required in short order; money that might have been otherwise spent on broadening the choice of reading books throughout the school will now go to narrowing it. There will be little time to draw up and resource new teaching plans and work schemes, but hey, teachers are only working about sixty hours per week so there’s plenty of time for them to catch up. Secondly, and far more seriously, there are paedagogical issues. The reasons the two texts mentioned above have been so popular are several: OMAM is brief and relatively straightforward to teach; in my experience it did not stretch the most able students enough, but it was accessible to the less able, and enabled them to engage with literature. TKAM is a very well-loved novel, and rightly so. It’s complex enough to demand lots from the whole range of ability; it raised a wealth of relevant issues for teenagers to relate to, and it allows some serious analysis of how literature is created and how it works. I always felt a teacher must teach texts s/he loved, in order, first of all to convey some of that love of literature to students: the next generation of readers. Obviously, when one is teaching for an examination, the love of literature cannot be the be all and the end all: students need the skills of literary analysis, to understand how language is used to create all kinds of effects, and how plot, narrative and character are sustained and developed. I shuddered when I read the lists of texts that were being prescribed (and yes, whatever weasel words education secretaries and exam boards use, they are prescribing). Some are incredibly dry, some too long, some of no real connection to the world of a teenage student. Authors such as Hardy, Dickens and Austen are lengthy, use old-fashioned and more complex language codes and styles; they clearly have their place at higher levels or in life after study, but not in a classroom full of 14-16 year-olds. Does the Gove(rnment) actually want to kill off the study of literature in our schools? I think we should be told. Finally, there are some broader issues. When I first began teaching, there was 100% coursework; no exam, but a required portfolio of essays covering a range of different aspects of literature. Literature is literature, so the skills being taught and assessed were the same, as were the standards. The problem was abuse of the system by a small number of teachers and students; instead of addressing, policing and correcting these abuses, the system was done away with. The students I taught in those long-gone days read, studied and wrote about a far wider range of literature than today’s students, hemmed in by exam specifications, are able to do. I think the Education Secretary is not fit for purpose; nor are the exam boards and their new specifications. I despair for the current cohort of students and teachers; I’m glad I am retired, for I would not have the heart to inflict this sort of thing on my students or my teaching colleagues. I recently saw the RSC productions of Henry IV Part One and Two in Stratford during a Shakespeare course I took part in; we also watched a film of Richard II, so I thought I should complete the tetralogy by re-reading Henry V.
Shakespeare starts with a useless king (Richard) and ends with an effective one (Henry V); in between is sandwiched the reign of the illicit and troubled usurper, Henry IV; and yet his actions are suggested to have been necessary for the sake of the realm. Prince Hal has been transformed into Henry V, although there are times when this didn’t seem convincing. Both the plays Richard II and Henry V are very formal, ritualistic even, with much discussion in council and lengthy speechifying, Richard’s being beautiful and ineffectual, Henry’s being crisp, logical and directed. Court life during the reign of Henry IV was just chaotic. So there is a tidy sense of structure to this tetralogy. Henry V is unlike the others in the use of prologue and choruses; these help shape the effect Shakespeare wants to achieve, heightening the presence and power of the king, and creating description and atmosphere for the campaign in France, particularly by articulating the fears of those who are off to war. There are still lots against the king, but unlike those against his father, there are easily dealt with, and the traitors even repent in the face of Henry’s apparent rectitude and good sense. And the good king still ensures that traitors lose their heads. A less pretty side to Henry is revealed in the man of war and his threats against the French, but coupled with the conversations of the common people, the overall effect is to suggest what a dreadful thing war is in general, and how foolish those are that seek it (ie the French). Another interesting effect is that of the king wandering off in mufti and enjoying conversations with the footsoldiers and lower class members of his army; again we see their fears through their arguments with the king, and he is not always at his ease with the new role that has been thrust on him, though he sustains it and develops a sense of fair play and justice of which Shakespeare’s audience would surely have approved, when he reveals his true self to those men later on. This Soviet SF/ utopian novel was published in 1956, only three years after Stalin’s death. It’s set several hundred years in the future, when contact has been made with alien worlds and civilisations, and the frontiers of space exploration are being advanced. In this respect it resembles Asimov’s Foundation series of novels, but from a totally different perspective. The science of Andromeda is very dated, as is pretty much all SF from that period; perhaps the most astonishing gap, to a contemporary reader, is the total failure to imagine any kind of miniaturisation and digitisation, which has made so much of our current technology possible and so widely available. The biggest surprise, given that it goes without saying that a communist society as visualised in the 1950s has totally eradicated that ‘opium of the people’ which was religion, is Yefremov’s major focus on alternative kinds of spirirual and emotional flowering and fulfilment, which he and his future society seem to recognise as essential to human well-being; psychology, and balance in the personality are to strive for, and it is clear that the mental make-up of future citizens is quite different from our times. The novel is a fascinating glimpse of a future that can almost certainly never be, not because it wouldn’t necessarily work, but because there currently is no possible mechanism for getting from now to then. Yefremov gradually develops a powerful picture of the collective will to explore and discover and push forward the boundaries of our knowledge, a human trait that I have always felt is one of the best in our otherwise rather limited species. I couldn’t help but admire the crew of the spaceship at the end, setting out on a mission so lengthy that they would never again return to Earth, or see their friends and familiar places and faces again… and they went willingly. 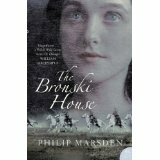 Interested readers may find this novel rather hard to track down; my copy is in the Moscow Progress Publishers series and I am unaware of any other edition. I’ve been writing this blog seriously for over a year now, though you will find posts going back several years. I’ve often wondered about my readers, and what they get from it. Some, I know, are ex-students of mine; others I’ve read about when you have linked from your blog to mine; others must stumble on me by accident, via a search engine. Years ago, when I finally finished being a student, I used to review books for Foundation magazine, an academic SF journal published by the Science Fiction Foundation, but eventually let that drop when my life and interests moved on. But now I’m back here, reviewing books and reflecting on being a writer of sorts, which feels a bit strange after having taught people to write as a living for many years.